Crocheted in Coats Puppets size 10 thread, with a 1.75 mm hook. Measures one and a half inches/4 cm across. 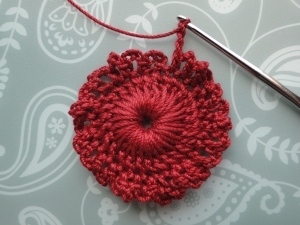 This is a more advanced crochet pattern, in that you work a round of stitches, then crochet over that round. Then you work over those two rounds to create the raised look of the flower center. 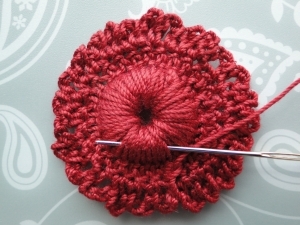 It's similar to the Irish crochet method of using a padding cord, I suppose, to give that "raised work" look. 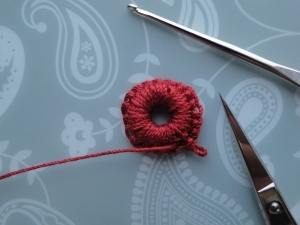 The difficulty comes in keeping your stitches and tension even. 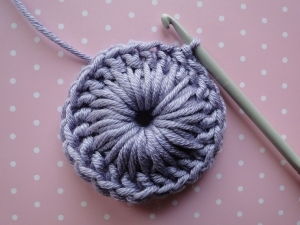 You need to have good control over what's happening with your yarn and hook. 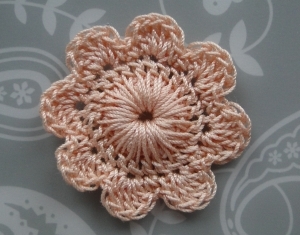 I would recommend you crochet a test flower first, so that you get the idea of how it works. 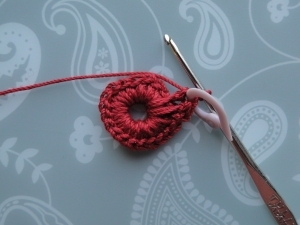 If you don't like how your stitches look, simply unravel back to where things went a bit wrong, and rework. 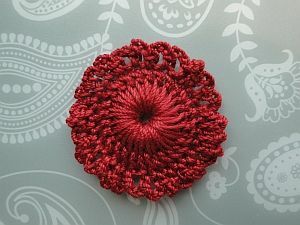 Oh, and I've added an alternative "petal" edging below if you'd like to try that! 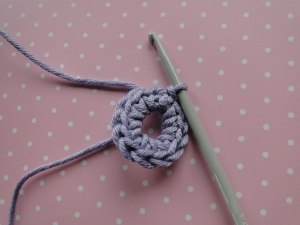 You can make any size of flower, starting with the length of chain of your choice. 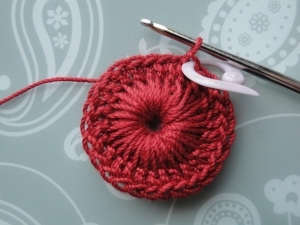 You can work as many stitches as look good to you in each round, too! 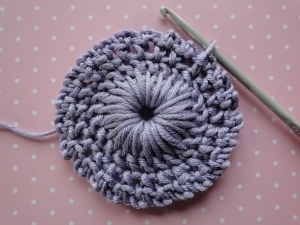 In my basic pattern and photo tutorial below I give you my stitch counts, but you don't have to stick rigidly to them. 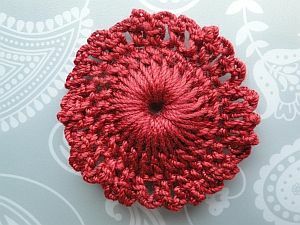 Then in my photo tutorial, you can follow each step to make the flower pictured at the top of the page which uses an 8 chain ring. 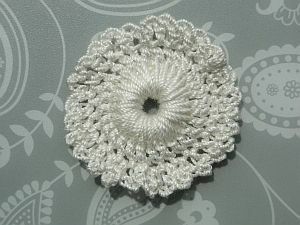 I've used a 7 ch ring for my Basic Pattern flower here, but you could go bigger. Join into 1st ch with a ss to make a ring. Ch 1. Work sc (UK dc) around the ring, as many as fit comfortably. Work over your tail end as you go. 7 ch joined to make a ring. 12 sc (UK dc) into the ring and joined with a ss. Round 2: Do not work a chain. Work sc (UK dc) over the stitches of the first round, working into the center of the ring as before. Work over your tail end again. I worked 18 stitches here. Without making any chain, I crocheted 18 sc (UK dc) around, working over the stitches of the first round. Round 3: Ch 1. Work dc (UK tr) into the ring, over your previous stitches. I stitch mark the 2nd stitch as we will work our joining ss into that stitch at the end. 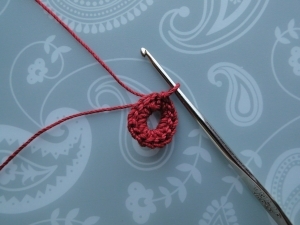 I crocheted 25 stitches here, but you can work as many stitches as needed, keeping them even. I worked 1 ch. Then 25 dc (UK tr) fitted nicely around, and I joined with a ss into the 2nd stitch. Round 4: Work neat, even-sized chain for this round. Repeat from * to * around, finishing with ch 3 and a ss into the joining ss from the last round. Tie off and weave end into back - more details on weaving in below. The edging is done, finishing with ch 3 and a ss into the joining ss of the last round. Ch 1, 14 sc (UK dc) into ring. 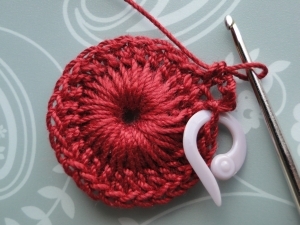 Work your stitches over the starting tail end as you go round. Do not make any chain. 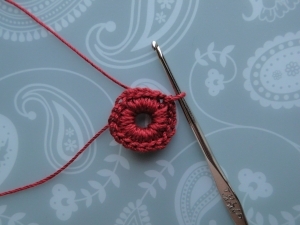 Working over the stitches of round 1, work 20 sc (UK dc) into the center of the ring. 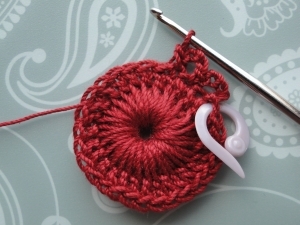 Keep your stitches relaxed but even, letting the yarn set its own tension, so to speak. Again, work over your starting tail end. Cut your starting tail end. 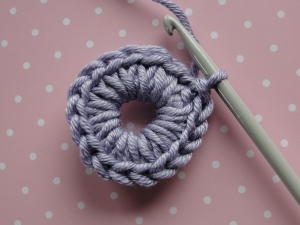 Don't cut your working yarn by mistake! Then work 26 more dc (UK tr) into the ring, again keeping your stitches even. 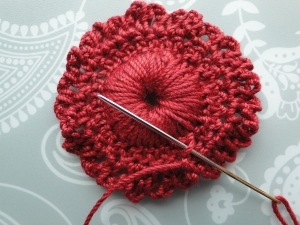 Join with a ss into the 2nd dc (UK tr) which is stitch marked. 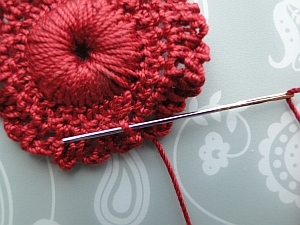 If you like, stitch mark your ss as we will join into this stitch at the end of the next round. 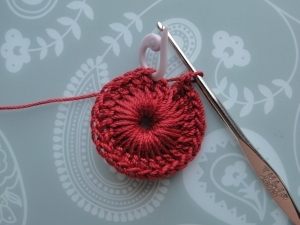 The stitch marker also keeps this stitch a little more open, so that it's easier to get your hook into it later, which is fine as far as I'm concerned! 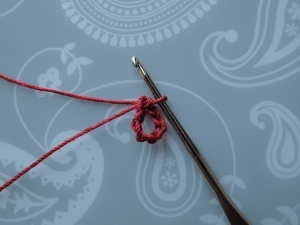 Tie off and gently tighten the knot. I worked exactly as above: make a 7-chain ring, ch 1, 12 sc (UK dc) in ring, ss join, 18 sc (UK dc) over those sts, ss join, ch 1, 25 dc (UK tr) over both rounds into the middle, ss join into second dc (UK tr) worked = 24 sts. 8th petal: 5 dc (UK tr) into next st, sc (UK dc) into next st, ss into joining ss from end of last round.